Embattled Salisbury Town Manager Neil Harrington has been ordered by Secretary of State Bill Galvin’s office (right)to turn over public documents he has been concealing from the taxpayers for months. Harrington was requested by Salisbury residents Joyce and Gracemarie Tomaselli, to turn over a certified copy of the vote adopting Article 28 from the Annual Town Meeting held on May 17, 1982. But, instead of releasing a copy of the actual document, Harrington redacted the information in that document and passed it off as compliance with the Tomaselli’s request. Galvin found Manager Harrington in violation of the state’s public records law and ordered him to release the actual documents sought by the Tomasellis. 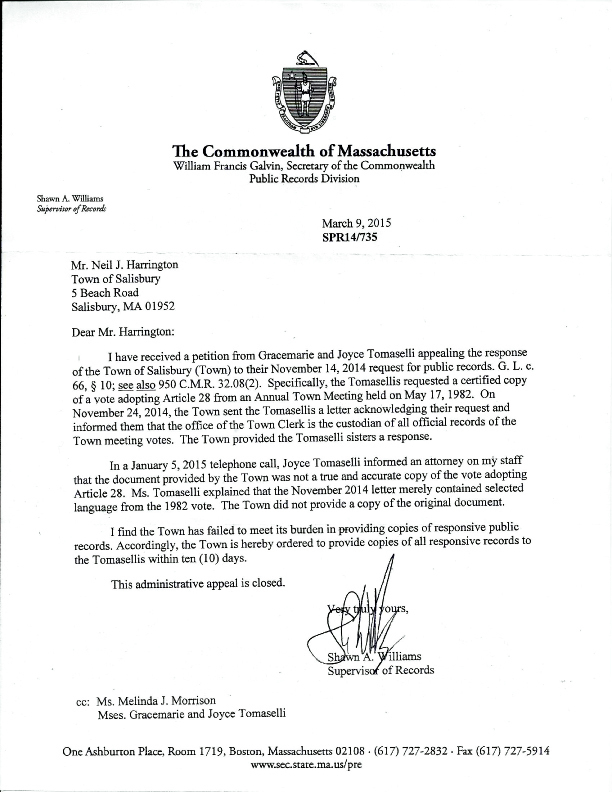 Between the time Secretary Galvin’s office sent the letter to Manager Harrington and the time we went to print, Harrington finally turned over the document sought by the Tomasellis. Harrington is no stranger to concealing public records. Last year Harrington also delayed and obfuscated a public records request by The Valley Patriot regarding how much money the town has spent on legal fees to fight the Tomaselli’s $15,000 fake sewer betterment. As a side note the town has spent more than $100,000 on that case. Even after meeting with Harrington in his office, where he agreed to release the documents we sought last summer, it was months before Harrington released some of the documents we sought, and only after the newspaper contacts Senator Ives’ office and Secretary of State Galvin’s office. Gil Medeiros, candidate for Selectman says that Harrington needs to be a better steward of the public’s records and comply with MGL Chapter 66, the state’s public records law. Currently, state law requires public officials to turn over public records within ten days of request, but the law has no penalty for those officials who refuse. Representatives Diana DiZoglio (D) Methuen, and Jim Lyons (R) Andover, to add penalties to the law for public officials who violate the public records law. Senator Ives says she expects her bill to get a vote in the legislature during this session.